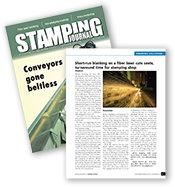 All-New Stamping manufactures custom precision aluminum stampings. Our staff has the experience and expertise to produce your part, whether it is a framing part for an airplane or a small, complex part for electronics equipment. Aluminum is widely used in the aerospace, construction, automotive, electronics and energy industries due to its high strength to weight ratio. It is the preferred metal for many components that require the strength and flexibility found in other metals, at a much lower weight. In addition, aluminum is corrosion resistant and has good thermal conductivity, providing superior performance in electronic and heating applications. It can be tempered to different hardnesses to improve strength, stability and wear. Aluminum is available in a wide range of alloys, from commercial alloys 1100, 3003 and 5052, up to aerospace alloys 6061, 2024 and 7075. It accepts a variety of finishes and coatings, such as Alodine®, chem-film, paint and powder coating, which can increase its corrosion-resistance, thermal and electrical properties. It also can be finished with a shiny, smooth surface for decorative components. The long wear life of aluminum offsets the relatively high cost of the metal. It is a recyclable material, and the use of recycled aluminum can reduce the material costs even further. We maintain a complete inventory of the most common aluminum alloys and laminates, with sheet stock thickness from .001-.250”. We also can provide specialty alloys or work with metals you provide.